Lock in a great price for Villa Nõva – rated 8.9 by recent guests! Modern facilities within a heritage farm-building setting and an interesting collection of old furniture and equipment. Spacious rooms, including bedroom, with a relaxed feel and wide use of natural materials. Ability to swim in a moat! Chance to wander into nearby nature area. Sense of exclusivity, with only three rooms in regular use at present. Le lieu est très retiré, assez loin de la route, mais le domaine est superbe et il y fait très calme. Всё понравилось.Хозяйка приветлива и общительная. Завтрак хороший. Номера чистые. Väga tore vastuvõtt ja sõbralik, vastutulelik personal. 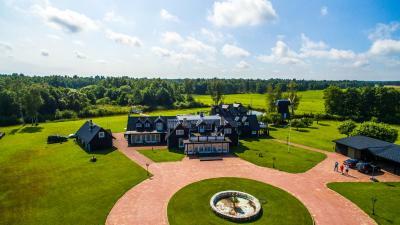 Villa Nõva is located among wildlife reserves and features a 3 ha garden. It consists of 3 buildings - main house bath house and mill house. Guests are welcome to relax in a sauna or enjoy fishing. Rooms include free Wi-Fi and wooden furniture. The spacious garden includes a playground for children and barbecue facilities. There is free, private parking for all guests. The surroundings of Nõva offer many hiking possibilities and include a river, green Estonian forests and sandy beaches. Nõva town center is 3.1 mi away. The Baltic Sea is a 9-minute drive away. When would you like to stay at Villa Nõva? House Rules Villa Nõva takes special requests – add in the next step! Please inform Villa Nõva of your expected arrival time in advance. You can use the Special Requests box when booking, or contact the property directly using the contact details in your confirmation. Breakfast was for slimmers: a wider choice is normally available at this price in Estonia. Around 1.4kms of gravel road from main road, but the building and setting are worth the journey.